Stepfamilies | The Law Office of Steven B. Chroman P.C. With summer vacation right around the corner, thoughts on how to keep kids busy, entertained, structured, happy, and distracted from the throes of your divorce are probably beginning. Kids who are home from school have a lot of available time that needs to be scheduled. Some will benefit from going away to camp or to their grandparents, while others will benefit from more one-on-one time with parents because they may find the isolation from divorce as alienating. A good place to start is by asking your older kids (12 and up) how they want to spend their summer before any final decisions are made. If your divorce is final, you are required to abide by your final divorce decree regarding summer visitation. If you do not yet have a final divorce decree, I highly recommend that you begin discussing with your ex-spouse a summer schedule for the children. (3) You can ensure that both parents will have some extended free time with the children over the summer. There is no shortage of tensions that can easily explode if unaddressed. In order to facilitate a peaceful summer, divorced parents will need to cooperate with each other. -Plan a budget for your child(ren’s) summer activities. -Plan for your child’s summer job- pick up, drop off and/or car situation. -Plan for how much time you will be with your child(ren). You and your ex-spouse (or soon to be) or the court may agree to modify child support payments in different amounts during vacation periods when the child is with the noncustodial parent more than during the regular school year or use that money towards activities, camp, travel, etc. If you are paying for child support, will you continue to pay the same amount of child support or can you agree to pay for other children expenses in lieu of child support? Make arrangements regarding who will drop off and pick up your child(ren). The Law Offices of Steven B. Chroman, P.C., are committed to helping you understand your options and make the best choices for yourself. Call our offices at 661-255-1800 for your FREE consultation today! As part of our Blended Family Friday series, each week we spotlight a different stepfamily to learn how they successfully blended their two families. Our hope is that by telling their stories, we’ll bring you closer to blended family bliss in your own life! This week, our reader Molly Walter gives us a primer on what it was like to gain a stepmom and two new siblings in her teen years. Below, Molly shares more of her family’s story and offers her best advice for kids in blended family households struggling to find their place within them. Hi Molly! Want to introduce us to your family? Sure! There are six family members total: My dad Chip; my stepmom Cyndy; my sister Hannah, 21; my stepbrother Steve, 21; my stepsister Annie, 19; and then there’s me. I’m 24. My dad and stepmom have been dating since 2005 and living together since 2008. They married in the spring of 2009. Your dad and stepmom got together when you and your siblings were a little older. How did you feel about it at the time? Originally, I thought our parents were very brave to try to merge families when all four of us were teenagers. But it miraculously all worked out and we all became very close right off the bat. Now, I’d say the biggest challenge is coordinating everyone. With four kids who live around the country and who all have two sides of a family to spend time with when they come to town, quality family time can be hard to schedule. For the few times a year all the college breaks line up, the time still has to be split between a lot of people, leaving little time for all six of us to be in the same place at once. It definitely requires lots of planning pretty far in advance. Since it can be so crazy, we make sure that all six of us spend Christmas Eve and Christmas morning together — we have our holiday traditions every year and know that we can always look forward to that time together, no matter what. I gained three amazing family members! My stepmom, stepbrother and stepsister are my family now and I love them as I love anyone else in my family. My three siblings and I are very close and I wouldn’t give that up for anything. What makes you proudest of your family today? How supportive we are of each other and how little not being biologically related matters. My stepmom treats my sister and I like her own children, my dad treats my stepbrother and stepsister like his own children, and the four of us kids all treat each other like we’ve been together from day one. We’re always there for each other and have an amazing supportive network in each other around the country. How does everyone manage the stress that comes with being part of a blended family? I think a lot of how we as a family deal with that stress comes from our parents. My dad and stepmom have always been really good about when we should handle things as a whole family and when our parents should deal with their own kids separately. Their example set a really great mentality for the family from the beginning. I also think that making time for the “original” families to hang out is an important part of being a blended family. What advice do you have for kids who are having a difficult time getting used to life in a blended family? The first thing I’d suggest would be to remember that this is hard. Your parent is marrying someone new and your family just got bigger with some weird, new people! But I would also say that your parent chose this person to spend the rest of their life with and that’s worth at least trying to make it work, as long as no one’s being cruel to you or anyone else. Talk to your parent or sibling(s) if you have any about your concerns and see if they have any ideas. Siblings are great because they’re likely having similar feelings as you. My sister was a huge help to have with me through the whole process, since she was also excited for our dad and new family, but had some of the same reservations as I did. Having someone in that same boat as you can be an amazing resource. Molly’s advice in Huffington Post’s article “This Stepkid Has Some Helpful Advice On Dealing With Blended Family Problems” has some great tips on how to manage in a blended family. Being open to the change is a key point in helping your new situation work. There are many aspects that go into organizing any family and those aspects seem to double or triple within blended families. Molly’s experience has worked out well for her and her new siblings but that’s not always the case for every family. Some situations are a lot less civil and the tension can be very apparent. If you found yourself in circumstances that aren’t as gracious, please contact our office for guidance. We can assist you and your family with issues that go far beyond simply getting along. This is a moment Lisa had with her friend—and soon to be ex-sister-in-law. A bond nourished for over 13 years was broken. There were tears and hugs, but the closure was hard to accept. Why does divorce lead to this kind of moment over and over? When some people are faced with a friend or family member who is going through divorce, it just seems easier not to have to take sides. For others, the relationship is severed because it was never really all that important. And there are people that try to maintain a relationship with both, and continue the link with grace. Some individuals experience an identity loss as they are no longer welcome in certain social circles, invited to parties or know where to sit at their child’s soccer game. Seek the help of a professional to help you cope with grieving the loss of these relationships. Divorce is a process; accept that there will be losses. Maintaining a positive outlook will help you stay strong and develop other fulfilling relationships. Ask yourself, “who am I?”and “what do I want out of life?” Shed the notion that you need to define yourself by who you were when married. Consistently talking about the loss of these relationships will drive people away; it means you have not moved on. Speaking negatively to your children about their extended family will make them feel that they are betraying you if they have a relationship with their grandparents, aunts, uncles and cousins, and you don’t want your children to feel like they have to keep secrets from you. If your children have had a positive and loving relationship with extended family and friends, it is important to keep up the connections because good relationships impact on how the children feel about themselves. As part of our Blended Family Friday series, each week we’re spotlighting a different stepfamily to learn how they successfully blended their two families. Our hope is that by telling their stories, we’ll bring you closer to blended family bliss in your own life! Want to know real stress? Get married, have kids, then get divorced and settle down with someone with kids of their own. From conflicts in custody agreements to vindictive former spouses edging their way into household drama, there’s no shortage of stress in the lives of blended family parents. So what can stepparents do to reduce some of the tension in their lives? Below, we look back at some of the best advice the parents in our Blended Family Friday series have shared with us in the past. See what they had to say, then head to the comments and add your best advice on beating stress in a blended family. 1. Figure out a co-parenting plan with your spouse early on. Parenting someone else’s kids is not easy — and those first few years are usually the toughest. That said, the road to peaceful relations with your new step-kid will be a lot less rocky if you and your spouse are able to come to an agreement on how you’ll parent, including who will be in charge of disciplining. On bigger issues with her step-kids, though, Bissell said her husband is the decider — and she’s fine with that. “I’ve also learned to give up control, which has been so hard, but ultimately a very good and necessary thing for our family,” she said. 2. When you start to feel overwhelmed, take it one hurdle at a time. 3. See your family — including the ex’s — as a team. Having an “us against them” mentality is the best way to sabotage your attempts to blend your family or get along with your ex, said Prentiss Earl, a father of two who’s still close with his ex-wife and her new family. 4. 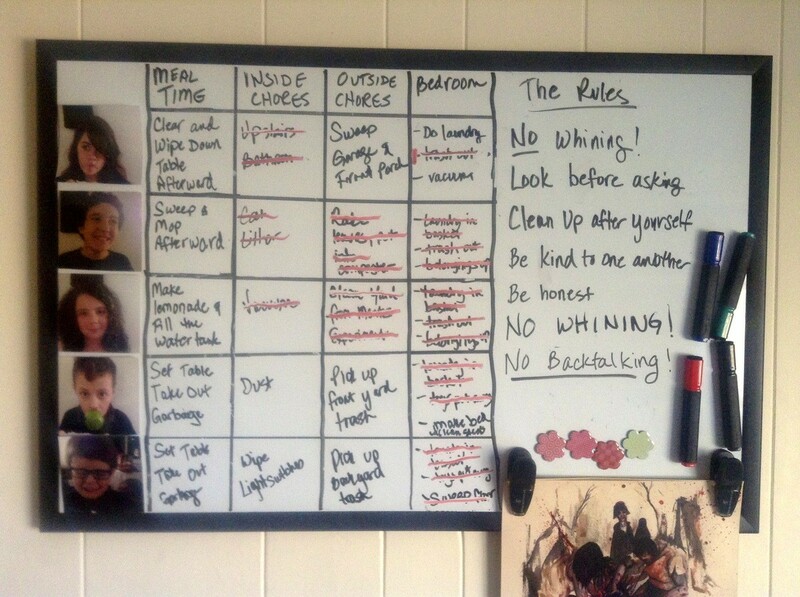 Invest in a chore chart. 5. Remind yourself to celebrate even the smallest of victories. 6. Whatever you do, don’t aim for perfection. In Huffington Post’s article “6 Ways To Beat Stress In A Blended Family” they have a few ideas that could really help step-families reorganize into an improved and productive lifestyle. There are many ways to beat stress but the key is to remember to do them! We have all had ideas and made promises to ourselves to do more, plan better and work harder. Life tends to change things around before we are even ready, so we need to prepare, plan ahead and always remember to work as a team. And sometimes that means you need to stand your ground to gain control of a situation and sometimes it requires that you relinquish that need to control and become more flexible in an already chaotic circumstance. Whether you are in a position that handles most of the choices for your family or at a point that feels as though you struggle to maintain the smallest of decisions, our office is here to assist you. There is always hope and we are available to help you with the steps that are essential to create an improved standard of living for you and your family, it’s worth the call!